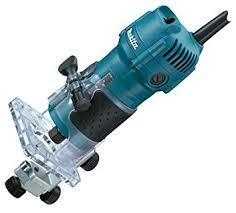 The Makita 1/4 in. Laminate Trimmer combines power and speed with precise control for smooth trimming and routing applications. It is engineered for woodworkers, finish carpenters and general contractors seeking a best-in-class laminate trimmer. The Laminate Trimmer features a 4-Amp motor with 30,000 RPM, ideal for smooth trimming and light routing applications.